FORT WAYNE, Ind. - The Fort Wayne TinCaps will host the sixth annual Parkview Sports Medicine High School Baseball Series at Parkview Field this spring. The series features 10 games, showcasing 20 different local schools in April and May, while the TinCaps are on the road. "Parkview Field is such a fantastic facility," said Tommy Schoegler, Director of Parkview Sports Medicine. "We're proud to provide our Parkview Sports Medicine partner schools with the chance to play at one of the premier ballparks in baseball." Similar to a TinCaps game, there will be giveaways, entertainment, and concessions for fans. Players will even get "big league" treatment with their headshots up on Parkview Field's video board. 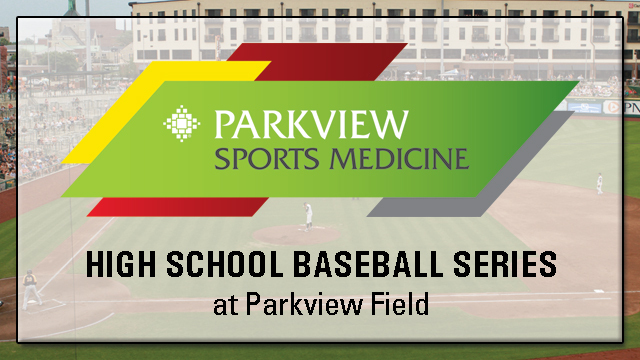 As in the past, all Parkview Sports Medicine High School Baseball Series games are scheduled to be broadcast live on TV (Comcast Network 81) and stream online (ESPNFortWayne.com and SummitCitySports.com). "Just like Opening Night and the Fourth of July, high school baseball at Parkview Field has become a tradition," TinCaps President Mike Nutter said. "Parkview Sports Medicine's support of these games is a true testament of their commitment to our community, and the TinCaps are thrilled to host these up-and-coming student-athletes." This year's schedule includes a celebration of East Allen County Schools on April 15 and Wabash County on May 9. Parkview Sports Medicine is the exclusive medical provider for 26 area high schools and five universities.